I began taking lessons with Ian when I was 13. Looking back at that time I could barely hold the drum sticks let alone string together a groove. If I was completely honest I must have had some innate talent or else Ian would not have taken me on as a pupil and persevered with me. The Drummer I am today is a direct result of his ability as a teacher and his willingness to share his skills. Ian is a hard taskmaster and expects 100% commitment from his students. With me he found a willing pupil and within 2 years I had accomplished more than I could have imagined. Improved technique, Rudiments, Styles, Theory and Sight Reading. I would recommend Ian's books. They are very effective and produce real results!! Achievements: Grade 8 - Distinction, Drummer for "Asking Alexandria" touring the world and living my dream, Thanks Ian! I have been playing drums for almost 40 years, since I was 7. Although I have played in many bands in my time, I’ve never had a lesson. However, having recently started playing in a band again, I decided the time had come to see where formal lessons could lead me. Ian had been recommended to me by a friend of a friend and what caught my attention, was the ability of the person I knew Ian had taught. I genuinely didn’t know what to expect – nor I think, did Ian. A self-taught drummer with 40 years of muscle memory and very little conventional technique must be a teacher’s worst nightmare. However, when we first met, he put me through my paces, which was much more about whether I was prepared to do what it would take to learn rather than my ability to play. He made it clear that my stubborn attitude to reading wouldn’t work if I wanted to get the most from lessons (he was right of course). I really liked Ian from the moment we met and was blown away by his effortless playing and ability, but more importantly his ability to explain things really clearly. I thought that if he could teach me even a tiny percent of what he knows it would be amazing. I have been having an hour lesson every two weeks for almost a year now. I’ve learned more in that time than I could ever have imagined. He is building otherwise absent foundations under my rhythmic house and pushing me to places I’ve always wanted to go but had no clue how to get there. His lessons hit the spot perfectly, we’re not doing grades, just focusing on things I want to learn, not just what Ian wants to teach. However, I know there is so much I don’t know, so I really enjoy it when he throws something at me that I haven’t even thought about before. I thoroughly look forward to my lesson and the fact that he is able to teach an old dog new tricks is testament to his ability if ever it was needed. Liam came home from school at the tender age 6 and announced to our horror that he was taking up the drums!!! The influence was from a marimba band that was at school at the time giving the children an insight to music in general. Thinking nothing would come of this, we tried to ignore the fact that this is what Liam wanted, but after six months of Liam’s persistence we started the arduous task of finding a percussion teacher. And no, I don't mean our son Liam………. If anybody would like to ask our family about Ian MacPherson we would only have praise and admiration for this man. Although Liam has achieved his grade 4 with distinction at the age of ten, it has all been due to Ian’s hard work, encouraging way and his firmness when needed - and yes, every young child needs this type of tuition in order to progress as our Liam has done. The moment I met Ian, I knew it was going to work well, the impressively professional studio and a warm greeting couldn’t fail to make a positive first impression. I’d been playing for about two years, Ian assessed my level, discussed what I wanted to achieve and we got started. I particularly like the structure that Ian brings to the lesson, which blends beautifully with his creative guidance. My progress from a clunky basher who couldn’t read drum music to someone who can now have a decent go at Back in Black by ACDC, has surprised me, but I don’t think it surprised Ian, he s done it before and he will certainly do it again. I would recommend Percussive Edge unreservedly. I have wanted to play drums for a long time and so for my 26th birthday, 10 months ago, I thought I'd look for a teacher. I came across Ian's website and Ian soon got in touch about the first lesson. It was quite an emotional experience to start to play some grooves along to familiar music. Ian's studio is amazing and he was so helpful in recommending sticks and equipment. He even sent me the links online, recommended the best music shop to get my drum kit and he gave me a huge book of grooves that he's composed himself. I have lessons once a fortnight and it is something I really look forward to. I can depend on Ian to guide my drumming and I've every confidence I'm learning to a high quality in technical ability and style. Not only is he a great musician, he is an awesome teacher as he is really friendly and understanding. Nothing is ever too much. I love the homework because I always get a range of things to work on. I'm moving away from Harrogate but I'm definitely keen to stay having lessons as I always come away on a high. I first learnt to play the drums in the 1970s – enough to do okay in school bands and pub gigs. But by the mid-1980s, working life had taken over, and I’d more or less given up. So when I decided to give it another go in the spring of 2014, I was very, very rusty. Fortunately, I found Ian. He proved to be exactly the teacher I needed: encouraging, positive, keen to get results – and yet with the patience of a saint. He’s also really easy to get on with, and has a very personalised approach to teaching. This is perfect for a ‘mature student’ like me, as he adapts the lessons to suit the way I want to improve, and always has a handy tip to help overcome specific weaknesses. Most importantly, Ian is a brilliant drummer, with vast musical knowledge spanning all styles and genres. It’s a real treat to hear him play. His set-up for lessons is impressive too. With excellent equipment and the latest technology, he can show you exactly how it’s done, while you learn and practise. This is the way to learn the drums properly, and to have fun while you’re doing it. I’d definitely recommend Ian to anyone, of any age. We had been searching on and off for some time for a drum teacher for James and then whilst looking on the internet I happened to come across Ian's Percussive Edge website and thought it looked really interesting, especially since he had taught one of James's favourite drummers (James Cassells). We are so glad to have found the website. From the first lesson Ian has been a huge positive influence for James. Ian channels everything he knows into making each lesson relevant and accessible at the level the student is working at. He regularly takes a lot of time outside of the paid for hour to plan, help James out if he is stuck, or give support and information to James. He gets back to you immediately if there are any questions. Ian is funny and easy to get on with and is a great role model and his drumming is incredible. Ian expects more of the student and demands high standards but in a positive way that motivates. Each session is tailored just to where each student is and it is obvious that allot of preparation goes into every lesson. Ian 's Communication is outstanding and everything is clear and structured. "Ian thinks of stuff that other drum teachers wouldn't bother to do to make it easy for me to learn, even altering the music sheets to make them easier to read. My drumming has come on really well and he is such a nice person. He expects a lot from you but that's a good thing because it's my future and he pushes you hard to help you be the best you can be." We would not hesitate to recommend Ian to any prospective students- he is the best drummer we've ever heard but he can also teach what he knows and that is a rare combination. - James, 16. I came to Ian having already had lessons for 18 months with a previous teacher. On my first lesson with Ian I was impressed with the equipment setup in his studio - it is a very professional setup. Secondly was how comfortable and relaxing Ian makes you feel during his lessons. What I can say about Ian as a teacher is that he is a true professional with a talent for getting the best out of you. I have learnt so much since having lessons with Ian and quickly realised that my previous teachings had not been of the same high quality that he produces. Ian has turned my playing around and developed me quickly. He has a real skill of explaining and demonstrating techniques to assist you as a student to improve your own playing. Ian's lessons are very well structured so I always leave with clear objectives and future goals. I cannot recommend Ian enough and only wish that I had started lessons with him from the very beginning. 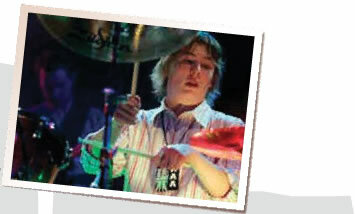 Ian has an obvious passion for teaching and playing drums which inspires you to want to improve all the time. Thank you Ian for all you have taught me and I look foward to our future lessons. I started drum lessons with Ian when I was 9 years old, I was a complete beginner, knowing nothing about music let alone the drums. I can honestly say if it was not for Ian I would not have gained the essentials necessities which enabled me to achieve Distinctions in Grade 3, 5 and Grade 8 by the age of 15. My progress is all down to the excellence in Ian's teaching. His determination for my sucess, and fantastic methods provided me with the knowlegde, technique and skills vital for a drummer. I strongly recommend anyone interested in playing the drums to attend lessons with Ian. You will not find a better teacher! I have been going to Ian for drum lessons for 6 years now and can honestly say without him my drumming experience would not be the same. From the moment I started with Ian my playing improved dramatically and quickly. Ian has helped me pass grades 2, 4, 6 and 8 all with distinction! I am very pleased with my grades however the technique and skill Ian has shown me through my time with him has attracted world class player Thomas Lang to take an interest in my playing and also Asking Alexandria drummer James Cassels. Ian has defiantly been a big part of my musical life and I owe so much of what I know to him if not all of what I know. I am sure Ian will always be part of my musical life and I certainly hope he continues to expand me not only as a drummer but as a musician, Thank you Ian! I had peripatetic drum lessons at school and found I had an aptitude for drumming but it was not until we found Ian that my drumming really progressed. Ian is a very likable and approachable person and a really inspirational teacher. I have really enjoyed learning to play the drums with him. I have progressed through grades with Ian, starting with Grade 3 and recently achieving Grade 8, each one passed with Distinction. I can honestly say that without his tuition, I would not have received these Grades. Each pupil is different, learning in their own way and Ian appreciates each person’s individuality, tailoring his teaching style to their needs to get the absolute best from them. On a one to one basis, with lots of different pupils, that is an enviable skill. The pass list on his website demonstrates this. Nothing has been too much trouble for him to help me learn, if I have struggled with anything, by the next lesson Ian has come up with some method (be it highlighter pen, memory stick or other idea) to help overcome it. Thanks for all the fantastic help and ideas Ian! I wouldn’t have got my Grade 8 Distinction without you! As a youngster I played drums at school and recently wondered, with some apprehension, about starting playing again after a gap of many years. I approached Ian and his subsequent lessons and encouragement have been inspirational. His professional expertise, musical knowledge and ability are second to none. Ian has a warm, engaging and effective teaching style and coupled with the first rate facilities in his studio, I find the lessons to be both highly rewarding and very enjoyable. My next lesson is always something I look forward to and I would highly recommend Ian to anyone thinking of taking drumming lessons – do it now before the opportunity passes you. "Finding Ian was the best thing that could have happened to our son who is well on the way to becoming a fine drummer. Jacob started with Ian as a total beginner and went on to achieve top marks in his drum exams thanks to Ian's excellent teaching. He made lessons interesting and fun and brought out the drumming ability in our son who achieved distinctions in all his exams, including the highest result in the country for Grade 5 and culminating with a distinction at Grade 8 Trinity Guildhall, again gaining one of the highest marks in the country. We would be very happy to recommend Ian as drum teacher." I had drum lessons with Ian for several years after switching teachers following a recommendation from a friend already with him. This was definitely the best decision I have made while playing the drums as I can’t think of better teacher both in his teaching techniques and personality. Ian is committed to getting the best out of your playing while creating a relaxed atmosphere that is easy to fit in to and play. He is always coming up with new techniques and styles which he thinks you will enjoy helping keeping the learning fresh and challenging . Ian is always warm and friendly making you get the most enjoyment out of your playing while you are there making the lessons something to really look forward to. Whether you want to do grades or simply improve your playing I would recommend Ian highly. I would also recommend the "Percussive Edge" books as they have really helped with the learning process helping build up my playing style. The studio set up is also excellent and really helps the teaching process. I cannot recommend Ian enough as he has definitely made me the player that I am today while creating a brilliant teaching experience that I will not forget. Thanks Ian! "I' have had Drum Kit lessons with Ian for several years now. I believe that the timescale in itself is testimony to Ian's teaching. Ian has the ability to inspire students and to consistently teach in a way which has you leaving the Percussive Edge studio eager to try out the new things you've learnt and improve. Ian's patient and yet very effective methods of teaching are the best way of learning, improving and developing as a drummer. I have always had that inner confidence in myself as a drummer because I know I have a great teacher. If you are thinking of taking up lessons then Ian is your man. I cannot recommend him enough. All of the testimonials you see are spot on. One other thing I would like like to mention is that he is just a great guy and I consider him to be not just my teacher, but now a good friend! Thanks Ian." As a hobbyist drummer I have to fit lessons around my family and work. In the two years since I started learning the drums Ian has been an excellent and accommodating teacher. His knowledge of drumming and patience with my slower speed of learning have kept the lessons fun, interesting and ultimately rewarding when I do make a breakthrough. As a skilled teacher Ian knows how to choose the material to meet my level of experience and always has several tricks up his sleeves to explain the difficult parts. I must say that I've enjoyed Ian's sincere and easy going attitude combined with a firm no nonsense professionalism. I confess that as a very late developer....a clue being the fact that I watched Keith Moon playing the Who's first hit "I Can't Explain" on TOTP in 1965. I have always had a passion for music in general and drums in particular so with more time on my hands I decided to test the saying "never too old to learn." After 5 or 6 lessons with Ian I now have the confidence and basic technique to build a foundation for steady improvement. I am really pleased with progress over 6 months from first picking up sticks and looking at drum notation. What I admire most about Ian is his modesty and his obvious sense of pride in the achievements of his students across the age and skill spectrum from a rank beginner like me to budding superstars!! Many have rightly credited their success to Ian's teaching and I am happy and humbled to contribute. This all inclusive approach is testament to Ian the man, and the teacher. Whatever age or skill level you can be confident that you will get value for money. Ian is no soft touch, he's a top professional with a great pedigree, so praise is only dished out when its well and truly earned. I like that and I like the thought of becoming as good as I can be with Ian's help and encouragement. Thanks Ian for opening up another chapter. "I started playing the drums when I was 13. I went without any lessons for nearly two years and struggled to improve and advance. Aged 15, I took up lessons with Ian and began to improve rapidly. Ian provided me with a wealth of learning material and as well as making sure lessons were very productive, also made playing the drums enjoyable. Practice was key to learning, but this was easy as through Ian's teaching I had a drive to play the drums and practice hard. Ian is brilliant at getting students through musical examinations, dissecting each part of the exam, making sure students go into them perfectly prepared and confident. Overall he has all the qualities you would want in a good teacher. He even inspired me to carry on and teach the drums myself, where in the beginning I was completely reliant on his methods and material in order to teach others. He is a very talented drummer, and a committed teacher, and the ability and great enjoyment I now have from playing the drums is completely down to him." I am a man of mature age (in my 50s!) and deep within me (since I was a boy) was a desire to be a drummer, however it wasn't until 6 months ago that I took up drumming lessons with Ian. With Ians great tuition, I have learn so much in so little time. As a person who hated school with a passion, I now have a passion for my drum lessons. I look forward to Ian's cool, calm, non-intimidating, patient approach to the lessons. We even have a laugh in the lessons (why wouldn't I not want to go!). He gets good results at a pace to suit the learner. For anyone who thinks it is too late to take up drumming - it is never too late with Ian's expert one to one tuition. You put in the practice in (lots of it) then Ian will make a drummer out of you - a good drummer! I always Look forward to my next drum lesson with you and really appreciate the effort you put into my lessons. From the moment I first meet Ian, I got along with him straight away and not wasting any time Ian asked me to play something right off the top of my head just to give him an idea of what he’ll be working with. I thought about it for a moment and played a Lamb of God song. Taking into consideration that Ian is not a complete fan of metal music, he told me how impressed he was with the first performance. This showed me from day one that Ian was not just a standard drum teacher. Ian was someone who actually cares and listens to students whatever their musical music taste is and someone that one way or another will find a way to mould that individual student into a true musician. Ian’s teaching technique is unique and different to any other teacher I would say. I would describe his technique as “planting a seed and watching it grow”. Ian will always go that extra mile for his students and do anything and everything to benefit their learning potential. Ian provides you with the reading, rudimental techniques and many other progressive technique enhancing exercises that a drummer needs in order to grow at a pace that works for you. In the end it is the commitment that you put into Ian’s work that will make the obvious difference. If you’re smart, you will do it and see real results. Wasting opportunities with a teacher like Ian is something you will live to regret. Teachers do not come as unique as Ian. He’s a true inspiration to my playing and always will be and it is safe to say I would not have achieved my Distinction at Grade 8 or attained a place at The Academy of Contemporary Arts in Guildford (ACM) without his constant support. Ian’s Percussive Edge Books have made such a difference to my progress and I would not hesitate to recommend them whether you take lessons with Ian or not. Cheers Ian! I had always wanted to play the drums, so when I turned 30 I thought I would finally give it a try. I was very nervous, especially as it was something I had always wanted to do - what if I couldn't do it? Ian has been amazing, from my first lesson I felt instantly relaxed and knew I had made the right decision. Ian has supported and encouraged me, lessons are so much fun that they go by so fast, then everything just falls into place. Ian's studio is amazing and his professionalism and friendly attitude makes such a difference, I couldn't have gone from not being able to read music to being able to play some of my favourite songs and even start working towards grades without Ian! I would highly recommend having drum lessons with Ian, I look forward to each and every lesson. I have been attending lessons with Ian at the Percussive Edge Drum Studio for almost 1 year now and I have improved so much from Ian’s beyond excellent tuition. Ian moves at a pace, which is most comfortable and tailored to your individual level of progress and fully makes sure that he is not overloading you with work. Ian gets the balance just right. When I finish a lesson, Ian has the ability to really encourage me to practice at home which is something I have never really experienced from any other tutor before. Ian is incredibly committed to getting you where you want to be and will not ever give up on his students. Ian has not only improved my technique, theory/sight-reading, styles, grooves, rudiments and literally everything you could mention, but has strongly improved my confidence when performing. An hour lesson seems to go by in minutes, and I always look forward to the next one! Ian is the best and most down to earth instrumental tutor I have ever had. EVER!! And I am really going to miss him as a teacher when I go to university. I would definitely not be where I am today without Ian, and I cannot thank him enough. I would be insulted if you went anywhere else for drum tuition. Check Ian’s books out. They are fantastic and will improve every aspect of your playing. Cheers Ian! "I have been drumming now for 10 years and am looking to take it further as my career, I strongly believe Ian played a huge role in creating the drummer I am today, and if I hadn't moved away, would still be guiding me. I started lessons with Ian at the age of 16 years old and his immediate friendliness, professionalism and capabilities instantly made me feel comfortable and confident to play to the best of my abilities. What sets Ian apart is his commitment to you. When you go home he is still thinking of ways to help you improve and carries on with ideas so when you come back to following lesson, you are always hooked, excited and quickly see results. He helped me through my grade 8 and plenty of other opportunities that wouldn't have been possible if it weren't for him. Ian's results to the right speak for themselves, very few tutors have a 100% pass rate, and for this and many facts I would never hesitate in recommending Ian to anyone and everyone. Thanks Ian. I have been attending Ian's drum lessons since 2012, and I can confidently say that he has brought out the best in me. Ian has taught me everything that I needed to know, from all the simple things to the more complicated material. In just over a few months he had managed to get me to grade 2 standard; and even passed my very first drum exam with a result of 100% with distinction. His lessons are always really helpful and I always come out at the end of the lesson feeling very satisfied. He is very thorough with his teaching, and always creates a good learning atmosphere. I highly recommend Ian to anyone looking for a drum teacher. He is certainly the best around! "My son Dan was a complete beginner when he first commenced lessons with Ian. I have been very impressed as to the excellent structured tuition methods that Ian designed and adheres to. In addition to the actual teaching, Ian also continually passes on an excellent work ethic and enthusiasm which I am sure has contributed to Dan passing his grading examinations with Trinity Guildhall (3 & 5 & 8) with Distinctions in a relatively short time, and the wish to pursue his drum studies all the way. I would most definitely recommend "Percussive Edge" to anyone, Ian's results speak for themselves." Although I had had drum lessons for a number of years before commencing lessons with Ian, it was not until I made this switch that I began to notice a much larger improvement in my playing. Ian’s varying teaching styles cater for people of all ages, abilities and whether or not you want to pursue grades or just start a new hobby. Ian ensures that he will get the best out of you whilst keeping each lesson unique and exciting and introducing you to a broad range of musical styles. The studio set up provided is excellent and, along with Ian’s friendly, welcoming nature this creates a fantastic teaching environment perfect for anyone. I would not hesitate to recommend Ian to anyone and cannot thank him enough for his time and the memories. Thanks Ian! After having a few years break from drum lessons with different teachers i decided to start pushing myself again and took up tuition from Ian and immediately got passionate about drumming again Ian analysed my drumming from what i have been taught previously and showed me new and better techniques and we started building my drumming skills, now a year down the line i regret not going to Ian for lessons years ago as my drumming has never been stronger and continues to grow with every lesson and every piece of drum material. Ian's lessons really show in playing in my band Purple Mafia which has had much success recently county wide and LA record label thanks Ian! "Ian has taught me drums from being a beginner through to grade 8 Trinity Guildhall and I have enjoyed every lesson with him. Ian has taught me in a very structured way from day one and has given me confidence with my playing as well as teaching me all the techniques required for each grade in a fun and enjoyable way. I would strongly recommend all his books 'Percussive Edge' to anyone wishing to be advance from a basic level to grade 8, as well as recommending his high class teaching which clearly produces excellent results. His results are there to see." "I commenced lessons with Ian after trying out other teachers first... And I haven't looked back. I have progressed massivley and my love for the drums is continuously growing. Ian provides me with the materials to take my drumming to a whole new level (whether it be jazz, metal, rock etc...) and his teaching skills are the best I have come accross. I have just taken part in the districts largest "Battle of The Bands"competition at The Amp Awards 2011 in Harrogate and our Band "Summer City" won 1st prize. My current playing is a tribute to the work Ian puts in with me and has helped me to win best instrumentalist of the competition. Thanks a lot Ian!!" Ian is a fantastic man, he adds so much value to his lessons that he is obviously the most competitively priced. I have studied with Ian for a number of years and would recommend him every time, he has the ability to access every aspect of your learning with true care and determination. To me he is my drum partner, whenever I need information or regular lessons, for coaching and guidance, I go to Ian every time – no question. Ian’s talent as a drummer is evident during his tutoring and he has a great skill for imparting his knowledge onto you as one of his students. Thank you very much for the past 3 years of tuition. It has been a fantastic learning experience for me. Thanks to your masterful tuition and guidance I have been given a new feeling of much self-confidence.